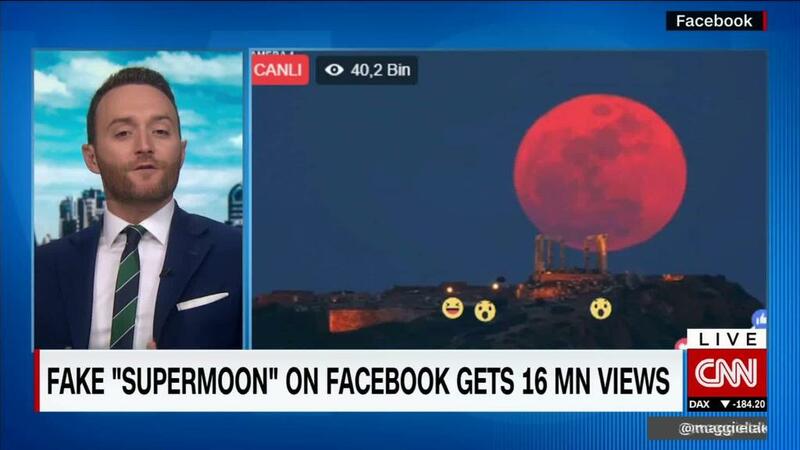 A Facebook Live video purportedly showing a live view of a "supermoon" over Greece but which in fact was a still image with wind sounds added was viewed more than 16 million times over four hours on Wednesday, apparently going undetected by the company even as some commenters pointed out that something fishy was going on. The stream featured a nine-year-old still picture of the moon over the Temple of Poseidon in the south of Greece. The image was overlaid with a current timestamp and the sound of wind was added in an attempt to make it seem live. The stream appeared as the first video result in Facebook searches for "supermoon." 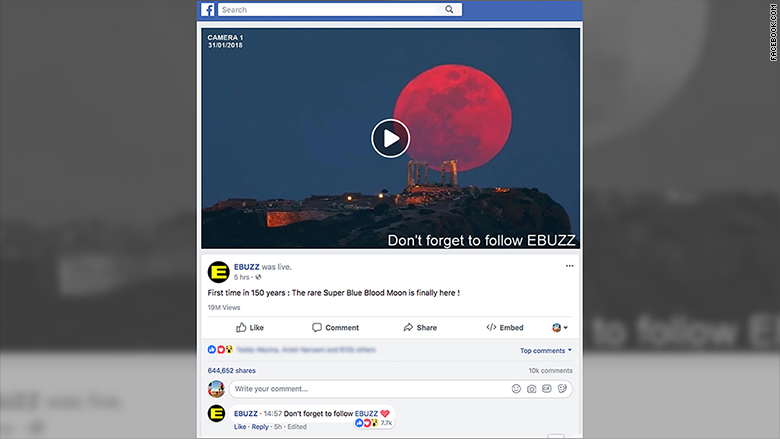 The stream was posted on a Facebook page named "EBUZZ," which despite posting only a handful of times since November 2016 has more than 250,000 followers. The page appears to be run anonymously, and it does not offer a way to contact its administrators. The video was removed from the platform by late Wednesday afternoon, but the EBUZZ page itself was still live as of Wednesday night. Facebook told CNN the video was removed for violating the site's policies. It did not say why the page itself was not removed. CNN determined that the photo used was taken by Chris Kotsiopoulos, an amateur photographer. Kotsiopoulos told CNN that he had seen instances where his photographs had been used without his permission before, but never in this way. It's unclear why the page would have faked a video in this way. The people who run it may have been looking to build up their follower base, which in turn could be used for other purposes, such as driving traffic to a website from which they make money. While some viewers of the live stream appeared to fall for the video, commenting on how beautiful it was, other users were more skeptical. "I'm curious how this is a 'live' feed when the same picture has been up for 3 hours with the moon in the same spot," one wrote. Many of the people counted in the 16 million views tally would likely not have seen enough of the stream to realize they were looking at a still image. Facebook counts a "video view" when a user watches a video for three seconds or more, including those times when people see the video for more than three seconds in their News Feed. It's not the first time a fake video of a high-profile event has racked up millions of views on Facebook. In September, during Hurricane Irma, a video stream purportedly showing "shocking video" of the storm picked up more than 6 million views, though it actually contained video that was at least nine months old.